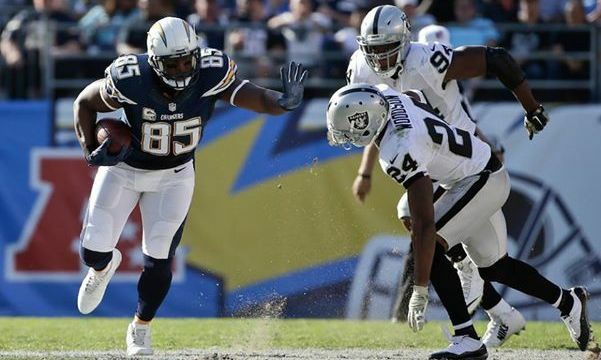 Chargers tight end Antonio Gates during earlier win over the Oakland Raiders. 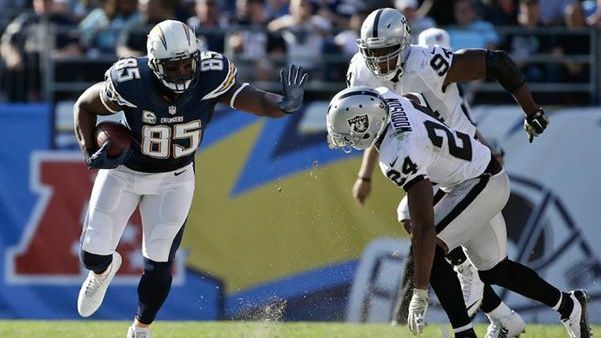 Photo via Chargers Facebook. Sunday’s game between the Chargers and Raiders remains set for Oakland despite poor air quality caused by fires in the area, and a reported willingness by San Diego’s mayor to host the contest at SDCCU Stadium. The Bay Area has been beset by smoky conditions resulting from multiple fires in wine country, which have killed nearly 30 people and destroyed scores of homes. The Raiders have rescheduled practices the past couple of days, and it’s unknown whether skies will clear enough for the game to be played in Oakland. NFL.com reported that a league spokesman said they’re monitoring the air quality situation and are in contact with both teams. “At this point, the game remains scheduled for Sunday in Oakland,” said the spokesman, Michael Signora. Meanwhile, San Diego Mayor Kevin Faulconer’s chief of staff, Aimee Faucett, told The San Diego Union-Tribune that the city would be happy to help out by hosting the game, if necessary. Faucett said the city hasn’t been contacted by the NFL. The Chargers moved from San Diego to the Los Angeles suburb of Carson for this season, after spending 15 years in an unsuccessful bid to have a new stadium constructed for the team.